Our bodies aren’t shy about telling us that we are stressed out! Muscle tension, backaches, stomach upset, headaches, burnout and other illness states are ways in which the body signals to us the need to relax. Rather than run for that anti-anxiety medication, we can utilize our easiest, natural defense against stress: our breathing. The way we breathe can affect our emotions and mental states as well as determine how we physically respond to stress. The general physiological response to stress is called the stress response or “fight or flight” response. When we experience stress, hormones activated by the sympathetic branch of the autonomic nervous system flood our bloodstream to signal a state of readiness against potential threats to our well being. While these hormones serve to help us act quickly and with great strength during emergency situations, they exemplify the concept that there can be “too much of a good thing.” Chronic stress results in excess release of stress hormones, which can cause immune-system malfunction, gastrointestinal issues, and blood vessel deterioration, among other health complications. Over time, such symptoms can evolve into degenerative diseases like diabetes, obesity, and cardiovascular disease. We can help preserve and enhance our health, though, by refusing to fall victim to chronic release of stress hormones, even if we are not able to control when or how stressful situations challenge us. We can learn to effectively manage our physiological reaction to stressors by teaching the body to induce a relaxation response. A relaxation response counteracts the effects of the fight or flight response by helping to boost immune system function, reduce blood pressure and cortisol levels, and protect tissues from damage caused by stress-hormones. The way we breathe affects our autonomic nervous system (ANS), the branches of which signal automatic physiological reactions in the body, like the fight or flight and relaxation responses. ANS activity is outside of our conscious control. The ANS is responsible for managing our breathing, heart rate, body temperature, digestion, and other basic processes necessary for survival. While the sympathetic branch of the ANS initiates the stress response, the parasympathetic branch induces a relaxation response. Our somatic nervous system, over which we do have conscious control, makes possible the movements of our eyes, limbs, and mouths, for example, as well as how (not whether) we breathe. Thus, we can, through somatic manipulation of our breath, affect which ANS branch remains active, especially during moments of stress. One of the best means of inducing a relaxation response is through diaphragmatic breathing: inhaling deeply through the chest and virtually into the stomach. Engaging the diaphragm may be the key to inducing a relaxation response through deep breathing because the diaphragm’s close proximity to the vagus nerve. The vagus nerve is a cranial nerve which supplies approximately 75 percent of all parasympathetic fibers to the rest of the body, and may be stimulated through diaphragmatic movement. Conversely, thoracic breathing that is limited to the chest cavity is associated with the sympathetic branch stress response. Situations may catalyze stress for us when we are uncertain about them or unable to control their outcome. We may feel helpless, overwhelmed, fearful, or forced into stifling our true feelings, and may experience additional anxiety over our inability to control the resulting hormonal fight or flight response. The key to stress management is recognition that while we may not be able to control the stressor, we can always control our reaction to it. We have choices: whether to relax through diaphragmatic breathing techniques until we feel ready to make beneficial decisions, or to just react while on sympathetic branch automatic pilot. Even if we don’t find a solution to the stressful situation, choosing to take time out to breathe protects our bodies from detrimental effects of stress. Upon experiencing fear or anxiety, our diaphragm involuntarily flattens and we breathe in a shallow manner as our body prepares for action. Armed with the knowledge that we can create a counter-response by breathing deeply, we can change any automatic course of action. When a stressor engages us, we can consciously control the speed and fullness with which we inhale, trusting that a relaxation response will happen as long as we keep breathing in this manner and do not lose patience. Recognizing the need to breathe diaphragmatically is half the battle; actually doing it is what empowers and frees us. To practice diaphragmatic breathing, lie down on your back or sit in a comfortable cross-legged position with your back as straight as possible (maybe against a wall) and close your eyes. Place your hands on your abdomen. Slowly inhale, filling your lungs and what seems like your stomach, to the point where your hands rise with the breath. Hold your breath for a few seconds, then slowly exhale completely. Repeat this process for many breaths, savoring the recognition that you are sending life-sustaining oxygen to all the cells of your body. One of the keys to creating a relaxation response is to “be the breath.” Focusing on the breath helps you be present. When thoughts enter your mind, acknowledge them, let them go, then refocus the mind on the sound of your breath. Perhaps visualize a relaxing scene or imagine continuous ocean waves slowly rolling into the shoreline. Maybe listening to peaceful music or repeating a mantra in your head that brings you serenity will help you free your mind of distracting thoughts. Your memory is another tool you have to facilitate relaxation. Recalling a time of great happiness can help you replace negative feelings with pleasant ones. Tapping into your particular spiritual belief system at this time might also help you relax; some people find that saying a prayer while breathing deeply can help decrease stress. Fear, for example, initiates thoracic breathing associated with sympathetic branch activity. When we breathe in a shallow manner, we utilize only half of the alveoli (air filled sacs) in our lungs. Diaphragmatic breathing employs all the alveoli in our lungs while helping the body and mind relax. 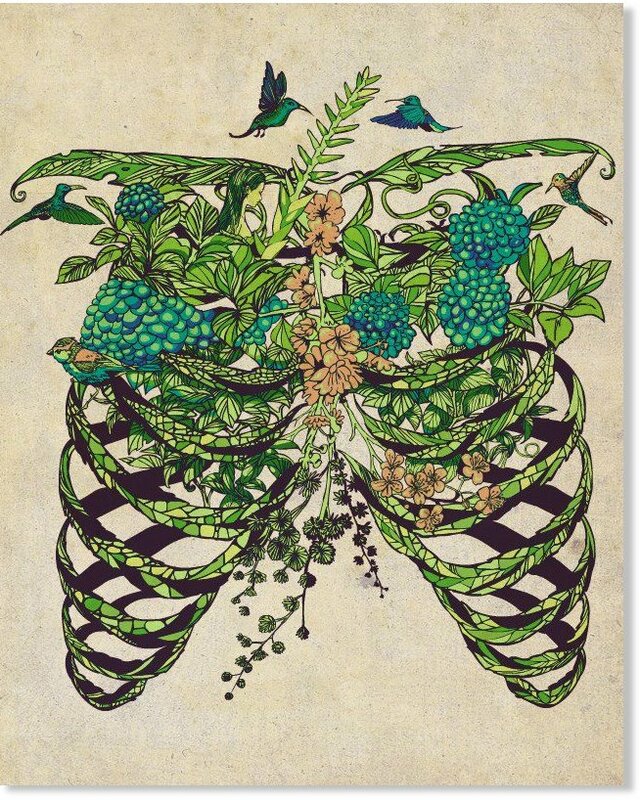 By repeatedly expanding our lungs to full capacity, we improve our metabolism by increasing oxygen supply to the rest of the body, promoting detoxification in the lungs, and enhancing digestion. We may also be able to change the emotions which engendered the stress response by releasing their power over us through the breath. Clear thinking and creative decision-making may follow and lead to more positive emotions. The multidimensional effects of deep breathing illustrate the complex connections between the mind and the body and enhance our understanding of stress-related disease prevention and treatment. The solution to stress lies within us. Nature has given us a defense mechanism with which to combat the physical effects of stress: parasympathetic nervous system activity catalyzed by diaphragmatic breathing. While breathing alone may not resolve the issue stressing us, it can empower us to healthfully adapt on mental, emotional, physical, and even spiritual levels. Consciously breathing is a core element of mind-body philosophies such as yoga,meditation and Tai Chi (diaphragmatic breathing as described in this article most closely resembles meditation). Mind-body disciplines, such as Yoga and Tai Chi, which embrace specific postures and/or fluid movements offer added benefits of improved balance, flexibility and circulation. Regularly practicing diaphragmatic breathing through any mind-body technique can help us establish a relaxation routine. When something is routine, we can “just do it” (i.e. let our thoughts go because we don’t need to think so much about what we are doing). A movement–based breathing practice may be the best means of relaxation for more physically active people, and can be a great way for less-active folks to get some exercise. For some, spirituality may permeate the mind-body breathing practice. The role of spirituality in stress management may relate to how we perceive situations beyond our control. Wayne Dyer, an inspiration guru, lectures and writes that we are eternal spiritual beings who are having temporary human experiences, which seems like another way of saying “don’t sweat the small stuff.” Believing in a higher power (whatever that means to us individually) can relieve us of the perceived burden of always having to handle things on our own. Learning to cultivate a relaxation response may involve trying various methods until you discover the one that works for you. Finding a technique that you enjoy is the key to making it a lifestyle habit. When you feel the effects of stress… just breathe. Sinatra, S. Heartbreak and Heart Disease.Keats Publishing, 1999. Stockdale B. You Can Beat the Odds: Surprising Factors Behind Chronic Illness and Cancer. Sentient Publications, 2009.